We provide a huge assortment of Commutating Choke that is in high demand in the national and international market. Our Three Phase Commutating Choke is manufactured from the high grade raw materials under the guidance of experts. Commutating Power Choke offered by us is a high performance choke that provide brilliant performance even in harsh conditions. It is a heavy duty choke that needs low maintenance. 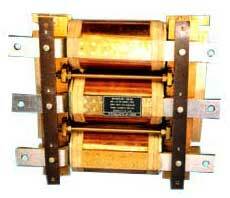 We have carved a niche as the most preeminent Commutating Power Choke Manufacturer, based in India. © Copyright 2009 - 2010. Step-Up Electricals Pvt. Ltd.